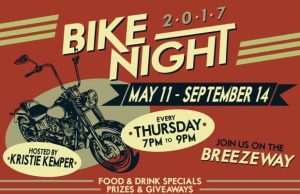 We’ve Partnered with QFM 96 (The Iconic Rock Station) to be on-site at Bike Night at Eldorado Scioto Downs every Thursday this summer! During the season, we’ll be giving away 2 Rockford Fosgate Motorcycle Sound Systems plus installation. Last night, (7/20) was our first system giveaway, plus one of our Motorcycle Techs was on-site doing a partial LIVE sound system install! Congratulations to the lucky winner, who went home with his own motorcycle sound system! This entry was posted in Events on July 21, 2017 by Hollie Prater.